Parameterization of molecular complexes containing a metallic compound, such as cisplatin, is challenging due to the unconventional coordination nature of the bonds which involve platinum atoms. In this work, we develop a new methodology of parameterization for such compounds based on quantum dynamics (QD) calculations. We show that the coordination bonds and angles are more flexible than in normal covalent compounds. The influence of explicit solvent is also shown to be crucial to determine the flexibility of cisplatin in quantum dynamics simulations. Two empirical topologies of cisplatin were produced by fitting its atomic fluctuations against QD in vacuum and QD with explicit first solvation shell of water molecules respectively. A third topology built in a standard way from the static optimized structure was used for comparison. The later one leads to an excessively rigid molecule and exhibits much smaller fluctuations of the bonds and angles than QD reveals. It is shown that accounting for the high flexibility of cisplatin molecule is needed for adequate description of its first hydration shell. MD simulations with flexible QD-based topology also reveal a significant decrease of the barrier of passive diffusion of cisplatin accross the model lipid bilayer. 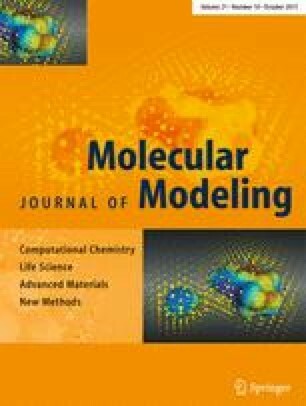 These results confirm that flexibility of organometallic compounds is an important feature to be considered in classical molecular dynamics topologies. Proposed methodology based on QD simulations provides a systematic way of building such topologies. The online version of this article (doi: 10.1007/s00894-015-2812-0) contains supplementary material, which is available to authorized users.